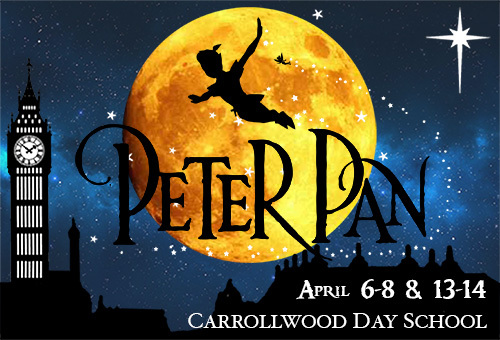 Carrollwood Day School is proud to present Peter Pan... Soar away to Neverland with us in this timeless musical adventure! We will whisk you away to a place where dreams are born and no one ever grows up! Peter Pan and his mischievous fairy sidekick, Tinkerbell, visit the nursery of the Darling children late one night and, with a sprinkle of pixie dust, begin a magical journey across the stars that none of them will ever forget. In the adventure of a lifetime, the travelers join the lost boys and girls and come face to face with a ticking crocodile, a fierce Indian tribe, a band of bungling pirates and, of course, the villainous Captain Hook. Peter Pan is the perfect show for the child in all of us… who dreamed of soaring high and never growing up. The cast for this production is made up of nearly 90 talented students from CDS elementary, middle school, and upper school divisions. 5:00 p.m. - 6:30 p.m.
Make reservations on the online Box Office when you purchase tickets to the show!